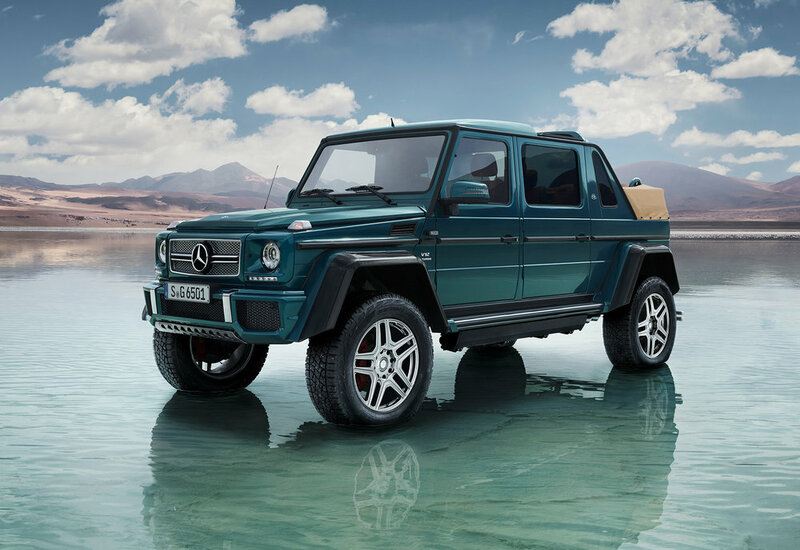 A new G 650 Landaulet has been unveiled, becoming the first off-roader from the Mercedes-Maybach sub-brand. The open-top G‑Class follows the equally luxurious AMG G 63 6x6 and G 500 4x42. With a V12 engine, portal axles, electric fabric top and exclusive equipment specification in the rear compartment, this is described as a very special all-terrain vehicle, limited to 99 units. The most powerful available engine - the Mercedes-AMG V12 biturbo - delivers a maximum output of 630 hp with a peak torque of 1000 Newton-metres. Returning 13.8mpg with CO2 emissions on the combined cycle of 397 g/km, the new G 650 is never going to win any green car awards. At 7.3-feet tall, almost half a metre of ground clearance and ample space and comfort for four passengers, the G 650 Landaulet represents a ‘unique combination of luxurious chauffeur saloon and off-roader’ says Mercedes‑Maybach. While the driver and front passenger are accommodated under the closed roof, the rear passengers, at the press of a button, can open a large electrically folding roof. On demand, an electrically operated glass partition separates the rear compartment from the driver's section. In addition, the glass can be changed from transparent to opaque at the press of a button. Thanks to a 578 millimetre longer wheelbase, rear passengers benefit from first-class seats, borrowed from the S‑Class but 'significantly enhanced'. The electrically multi-adjustable individual seats can be set to a fully reclined position. The active multicontour seats with ENERGIZING massage function have inflatable air chambers to provide high seating comfort and excellent lateral support. Massage programs make for 'enhanced well-being' according to the principle of a relaxing hot-stone massage, with heat. A large console with thermal cup holders between the individual seat allow beverages to be cooled or heated over a lengthy period of time. Similar to an aircraft seat, the centre console comes with two tables, which can be easily folded in or out. The table tops have leather inserts to provide a comfortable writing surface or to allow the use of tablets and notebooks. A "G cockpit”, finished in the style of the driver's instrument panel, houses the three distinctive centrally placed pushbutton switches. One switch is for the interior lighting, while the other two are used to open and close the soft top. The cross-member, which also holds the glass partition, accommodates two 25.4 cm (10‑inch) high-resolution media displays of the Individual Entertainment System. High-grade, two-tone designo upholstery with diamond stitching is available in four trim colours. Customers can choose between three different matching colours for the fabric top as well as four designo paint finishes, including a matt finish. Externally, exclusive "LANDAULET" lettering is worked into the rim flanges of the ceramically polished, 22‑inch, 5‑twin-spoke light-alloy wheels. Electrically extending entry aids make for easier access to the vehicle. Other exclusive exterior design features include front and rear underride guards, large wheel-arch flares in carbon fibre as well as, mounted on the right at the rear, the spare wheel with integral holder for the third brake light. Tyres of size 325/55 R 22 form the ideal basis for perfect handling both on- and off-road. The latest "G" also features 100‑percent differential locks, which can be engaged while on the move, as well as the low off-road ratio of the transfer case. The combination of this 4WD technology makes the G 650 Landaulet stand out from all other 4x4 vehicles, says Mercedes‑Maybach. The G 650 Landaulet will launch in the autumn, 2017 and will celebrate its world premiere and sales release at the Geneva Motor Show.